2.5mm Pitch Dis connectable Crimp Style ST extends its broad range of LED connectors with the addition of the LEX connector. 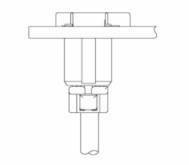 Designed for the LED lighting industry, this 2.5mm pitch, 2 way wire to board connector has been designed as a low profile bottom mounting type connector, with a profile height of 1.25mm at the connector mounting side. This provides a space saving solution for all general LED lighting applications. This surface mount (SMT) connector is suitable for a wire range of 30 to 22 AWG. It is also designed with a secure lock and a mechanism for preventing mis-insertion. The LEX connector is prepared using Halogen free and RoHS compliant materials, thus taking into consideration relevant environmental factors.